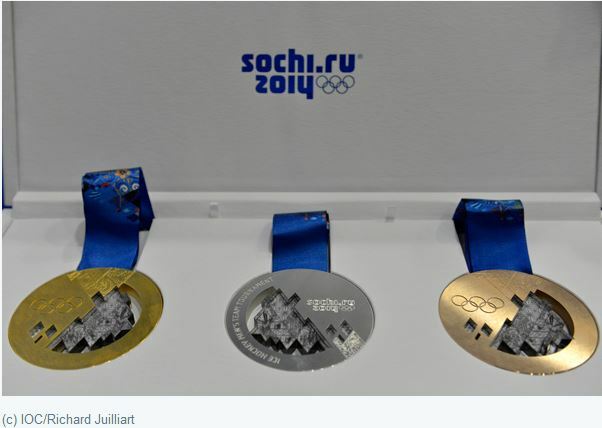 In honor of the upcoming 2014 Winter Olympics in Sochi, I thought it would be a good time to discuss gold, silver and bronze that are the metals in the Olympic medals. Since copper is the main metal in the bronze alloy, we’ll use copper as the index metal. Let’s start with gold. Recently, I had the privilege to discuss gold with Bluford Putnam, Managing Director and Chief Economist, of our partner, CME Group. We talked about gold as a safe-haven, the central bank buying and the potential shutdown of miners – all which are factors that may cause gold to skyrocket or plummet. In 2013 gold lost 28.3%, the most in a single year since 1981, when gold lost 32.8%. Then, the recovery period for gold after the 1981 loss lasted 25 years. Also in 2013, central banks stopped buying gold and assets tracking gold ETPs fell by about 50%. If history repeats itself, it may be a long recovery for gold but much depends on the fundamentals today. Many investors who view gold as a safe haven, may be wondering if gold really is a safe haven. According to Blu, there will always be some investors that hold gold as a safe-haven but the central banks are the keepers of the money and hold gold. 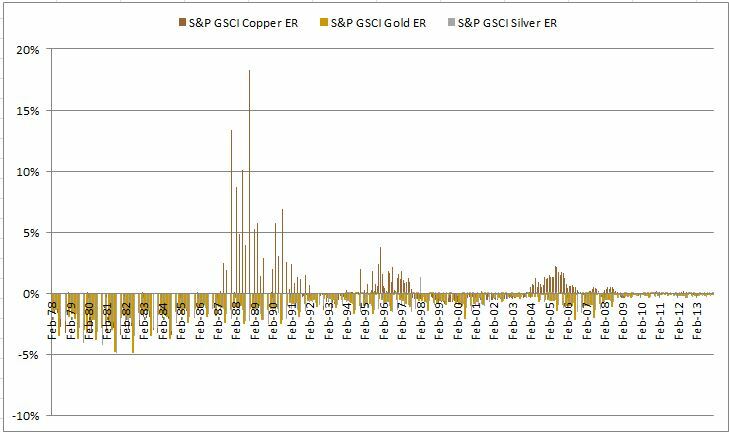 Although they started buying in the 1990-92 period, they stopped last spring since either they didn’t like the price action or they felt they had enough gold in their portfolio to be diversified. Given this, Blu feels the probability of disaster has really gone down, especially since many central bank actions have been put into place to prevent another storm. It seems a slowdown in central bank buying is clearly bearish for gold, but the relationship between monetary policy and gold is rather subtle. According to Blu, if we start to see inflation but the Fed takes no action, that may be strong for the gold price since the Fed will be behind the curve. On the other hand, if the Fed takes early action and decides to move before inflation, they will be ahead of the curve and that is not good for gold. Blu stated that there is a much higher chance the Fed will be behind inflation but that inflation may not occur until 2015. The last area of discussion between Blu and me centered around the impact of the gold price drop on gold miners. While some of the gold miners may have fallen into negative territory in 2013, some may not have been impacted since they may have hedged and locked-in an earlier, higher price. However, as the gold price approaches $1,200, Blu says that there might be some mine closures, but the reverse case of gold mining closures impacting the price of gold does not hold since when gold mines close the gold doesn’t disappear. The much bigger influence in the price of gold is from the jewelry buying from China and India. To any Olympic athlete, gold is the goal; however, that may not be the case for an investor. Let’s take a look at the statistics to see how the metals stack up. Below is a cumulative return chart of gold, silver and copper. Notice over the period that gold has the highest performance with a total of 593% followed by copper and then silver, gaining 452% and 283%. Source: S&P Dow Jones Indices. Data from Jan 1978 to Jan 2014. Past performance is not an indication of future results. This chart reflects hypothetical historical performance. Please see the Performance Disclosure at the end of this document for more information regarding the inherent limitations associated with backtested performance. However, few look at returns without considering risk. 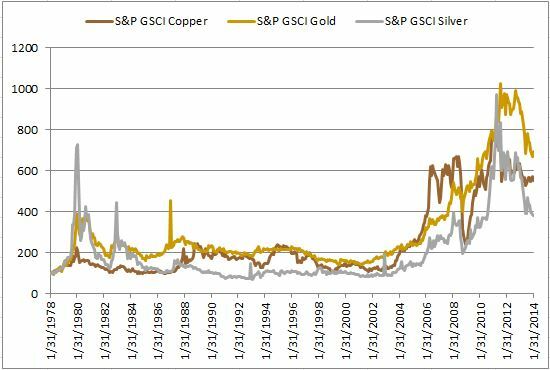 Over the time frame, risk as measured by annualized volatility was 47.6% for silver, 27.3% for gold and 26.3% for copper. Although silver had both the highest volatility and lowest cumulative return, it had the highest average monthly return, up 112 basis points. This is compared with only 73 bps for gold and 68 bps for copper in an average month. Further, in the average up month, silver had the highest gain of 8.9% versus only 6.0% for copper and 5.2% for gold. One might conclude taking the highest risk can pay off but looking at the downside counts as well. The reason gold had the highest cumulative return was since the average loss in a down month of -3.7% was smaller than for either copper’s or silver’s average monthly loss of -5.0% and -6.6%, respectively. One major difference between copper and both silver and gold is that copper is an industrial metal though gold and silver are precious metals. This makes copper more sensitive than gold to inflation. Another key difference from the fact that copper is industrial is that the supply/demand model is dramatically different. As Blu mentioned in the video, the gold is mined whether or not the miners shut down, but this is not the case for copper. Copper supply has been stifled by declining ore grades, equipment failures and shortages, and labor disputes. The impact can be observed and capitalized on by the roll return in the term structure of the futures curve. See the chart below of historical backwardation and contango in copper, gold, and silver and notice the high backwardation at times for copper that are missing from gold and silver. On average over the time period, copper’s premium or convenience yield was a positive 8 basis points per month, though gold and silver were abundant with average storage costs of 45 and 49 basis points, respectively. See the table below for more details of premiums earned, represented by backwardation (positive roll return) and storage costs paid, represented by contango (negative roll return). If we tally the count, and again using copper for bronze, the best medal is not as obvious to an investor as to an athlete. The bottom line is that gold is solid, silver has upside potential, and copper may be a winning hedge.